Gulliver is our 3+month old black Lab. He can be the most lovable puppy when he wants to, but sometimes he behaves as if he is crazed and bites us. We are trying all tips to curb this behavior and Gulliver will start obedience school in April. I know he will grow to be a good, loyal dog, but I am concerned with his agression. We had a female lab who passed away at 14yrs and never once did she act in this manner. Gulliver is quite smart and very manipulative. He brings much laughter into our home with his funny behaviors like running around the yard with a hoola hoop or jumping on our saddle swing for a ride. I love, love, love his puppy kisses and he actually gives us hugs. He is so precious, that is, when he is not biting. Our black lab, Gulliver, is now 20 months old. Several months ago, we moved from Pennsylvania to Florida and Gulliver has adjusted well. The development where we moved, has several empty fields where there are no houses built as of yet with large lakes. Gulliver runs freely, chasing sand cranes as well as many other birds in the area and enjoys a daily swim. Needless to say, he loves living here. Now, I am not fond of the frogs and lizards that reside among my landscaping that sometimes find their way into our home. Gulliver is always on guard watching for them and catching them at every opportunity. He then brings them to me with a proud grin on his face, as if to say, "I got another one for you!" The entire neighborhood loves Gulliver. He has made a point of introducing himself and greeting them when they come out of their homes. I never saw such a popular dog. When children are playing in their yards, he's right there with them, stealing their ball and making them chase him. 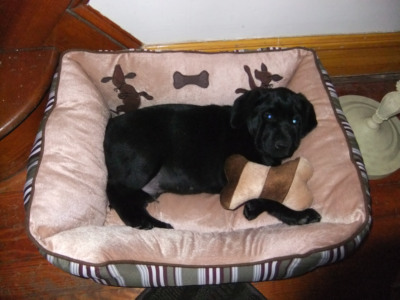 One neighbor loves Gulliver so much, she went out and bought a female black lab puppy. She is so precious. She and Gulliver will most certainly become best of friends. Soon to be 2 years old, Gulliver is truly a great companion for me. He makes life so exciting with his silly personality. It's no wonder he is the most popular dog that lives on the block. Oh my goodness, I love this dog so much. Gulliver is irresistible. He has an energizing personality that does not quit. He will soon be 6 months old and is losing his cute ribbon of fur down his spine with all his growth. Funny thing about Gulliver, he refuses to retrieve a ball, stick or any toy when out in our back yard. He much prefers you to chase him. He waits until you get very close, then darts away laughing at you. Indoors, however, he will retrieve 100 times a day. I must stop buying him toys. My adult daughter laughs at me and says Gulliver has more toys than she had as a child. He has his favorites, but becomes bored with them after awhile. Others he destroyed within two hours of play. There are days when he is so mischievious and other times so well behaved. Everyday is an adventure with Gulliver and I can't wait to see what he does tomorrow. Our Gulliver will soon be 5 months old and his biting behavior has stopped completely. He is the love of our lives and brings our entire family such joy. He understands so many words and fascinates us with his intelligence. Now if we could just convince him that he is not a lap dog or cat that can curl up and sleep on our laps!! He is so lovable; must give us super hugs and kisses daily. When my husband and I embrace, he has to get right in the middle to be included. Gulliver has a girlfriend that lives next door. She is a two year old yellow lab named Sage. We love to watch them play together in our back yard. He gets so excited when we tell him Sage is outside waiting for him. Gulliver was to the Vet yesterday for his second round of shots and I can hardly believe how much he has grown. He now weighs 33 lbs. and appears 3x the size since we brought him home just a few weeks ago when he was a tiny puppy. His behavior is improving, as he is responding to the training techniques we are utilizing, many of which I read here on the site. Thank you all for your input and the time you take to maintain this website. I, for one, really appreciate all your efforts.